Five players have been awarded Emerging Player Contracts by Cricket Ireland. The Pembroke duo of Josh Little and Lorcan Tucker, YMCA’s Jack Tector, CIYMS left-arm spinner James Cameron-Dow, plus Instonians all-rounder Shane Getkate. The Northern Knights duo were awarded their senior caps during the recent tour of India against Afghanistan, with Cameron-Dow also being included in the Test side. Lightning players Little and Tucker also featured in the white-ball segment of that tour, while Tector is the only one of the quintet yet to win a senior cap. There are no players from the North-West, which will come as a disappointment to former U19 internationals Graham Kennedy and Aaron Gillespie, while Northern Knights all-rounder Mark Adair might have been worthy of a contract given his strengths which seem ideally suited to the T20 game. Clontarf and Leinster Lightning's speedster David Delany’s exclusion is also puzzling, while leg-spinner JJ Garth may have been worth a punt too. Richard Holdsworth, Performance Director at Cricket Ireland offered hope however to those not selected, stating that the door was open for an additional contract to be offered. Andrew White, Chair of National Men’s Selectors explained the rationale behind the five players awarded the deals. “The Selectors see the Emerging Player Contracts as a successfully established part of the international player pathway. “The decision-making around recipients of these contracts very much takes into account the skill sets Graham Ford (Head Coach of Ireland Men’s senior team) will need over the coming years as part of a succession planning process. 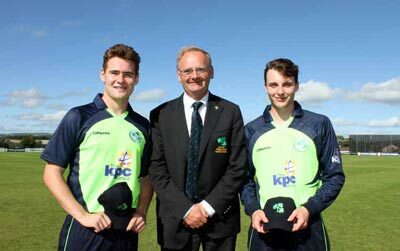 The Ireland Inter-Provincial season starts in Spain this year with three 50-over contests taking place starting on April 22nd. The full schedule for the interpro tournament can be found here.